June 12, 1952 – The Chicago Daily Tribune reports that the Herlihy Mid-Continent Company is the low bidder for the construction of an extension of the Ida B. Wells public housing project at Thirty-Seventh Street and Vincennes Avenue. The contractor submitted a bid of $4,482,000, and Chicago Housing Authority officials say the contract will be awarded after all the bids are studied and approved by the public housing administration of the federal government. The project will consist of 455 apartments in seven structures of seven stories. This will be the fifth of twelve new public housing projects to reach the construction stage. The project, named for African-American journalist and newspaper editor Ida B. Wells, was begun in 1939 and at its completion had 1,662 apartments. Demolition of the high-rise buildings of the community began in late 2002. 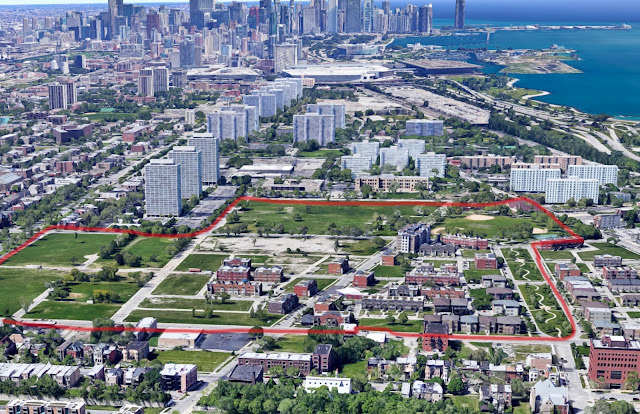 In 2003 construction began on the mixed-income community of Oakwood Shores, and the last two residential buildings of the former development at 3718 South Vincennes Avenue were levelled in 2011. The area outlined in read in the above photo shows the Oakwood Shores community as it exists today. June 12, 1929 – The Palmolive Building opens its doors for inspection as 60 tenants of the brand-new office building greet the respondents of over 17,000 invitations sent out before the occasion. 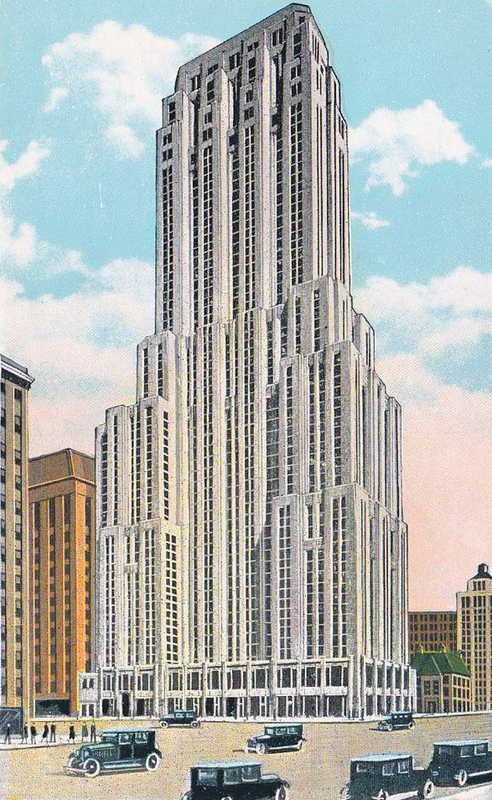 “The building marks a milestone in the city’s commercial development,” the Chicago Daily Tribune reports, “Located a mile north of the smoke and noise of the congested Loop and standing on one of the most important corners of Chicago’s most resplendent avenue – North Michigan at Walton Place – the towering mass of the Palmolive Building marks what will probably be for many years to come the dividing line between purely residential and commercial Chicago.” Today, of course, we call this building’s style Art Deco, but the look was still new in Chicago and, in fact, this office tower is quite different from its stylistic family members in the Loop, much more a “New York” style of Art Deco than the tower-and-flanking wings style that Chicago designers embraced. The Palmolive Building sets back in six different places so that floor areas grow increasing smaller, moving from 16,000 feet to 3,000 feet. Holabird and Root are the architects of the new building with Lundoff-Bicknell acting as general contractors. June 12, 1970 – One might peg this date as the day that Chicago finally began to get serious about cleaning up the Chicago River as Mayor Richard J. Daley announces plans to beautify the banks of the river along 38 miles, extending from the city to the Calumet River. Wait for it . . . “I hope we will live to see the day there will be fishing in the river,” said the mayor. “Maybe even a bicycle path along the bank. Perhaps swimming.” [Chicago Tribune, June 13, 1970] John Egan, president of the Chicago Sanitary District, says that the district is the owner of extensive areas of property along the river, much of it leased and that a lessee’s failure to improve that property could result in hearings and forfeiture. 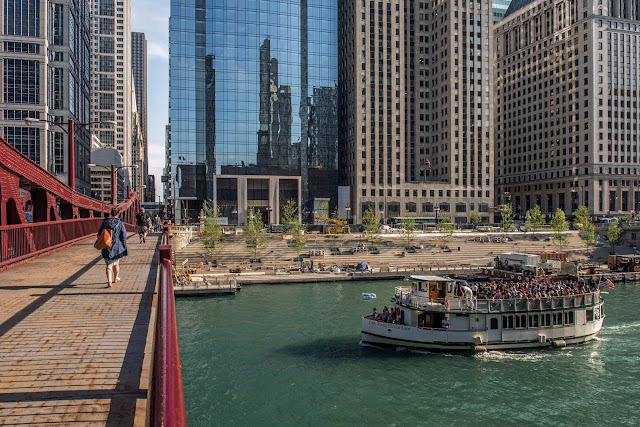 The city’s corporation counsel, Richard L. Curry, says that Chicago can fine river front polluters up to $500 a day. “We can get injunctions to force them to abate conditions, or the city can move in and do the work and file liens,” Curry says. Forty-six years later the city is still working on it, but the new River Walk on the main stem of the river shows clearly how far Chicago has come.